【Sensitive Control】Long press the switch, the children night light will light up, and the initial light color is defaults to white light. When you tap the night light, the color of the light will change and there are 7 colors in total. Long press the switch to turn off the light, or the light will automatically turns off after no manual operation. 【Brightness Adjustable】The children night light has three-level brightness for adjustment. The default brightness of night light is 50%, and it can be adjusted by pressing the switch. The brightness level can be switched to 50%, 70% and 100%. Also, the light mode can be changed from always bright to colorful loop. Seven-color mode and seven-color cycle color changing mode for chosen. 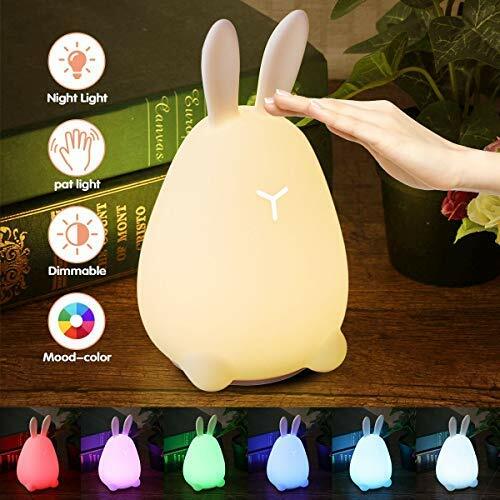 【Battery Rechargeable】With built-in 500mAH lithium battery, this night light is rechargeable, which takes 3-5 hours if fully charged (5V / 120mA), and can be used for up to 2 hours. 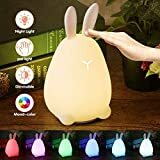 【User-friendly design】Using BPA-free washable silicone as material, the squeezable baby night light has cute rabbit shape, which brings a pleasant soft touch to your child. No sharp edges, no glare, perfect for babies, toddlers, etc. 【Great revelation for children】This children night light is not only suitable for lighting. This colorful light will stimulate the baby's color perception and promote the baby's visual development. It is a good partner for the baby. In addition, we offer a one year warranty for all valued customers. If you have any questions about this product, please feel free to contact us, we will resolve it as soon as possible, we will provide the best solution in the first time.